Zola Jesus in Montreal or Quebec City? Inform me about the next events for Zola Jesus. Enroll yourself to our priority waiting list for Zola Jesus to be alerted when new tickets are available. Filling this form doesn't engage you to any purchase. 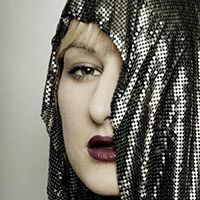 Zola Jesus has the real name Niki Roza Danilova. She is a singer, writer and American producer. She combines several styles, which makes her particular. She will be present at the Sala Rossa June 16, 2015.